ho, ho, ho! 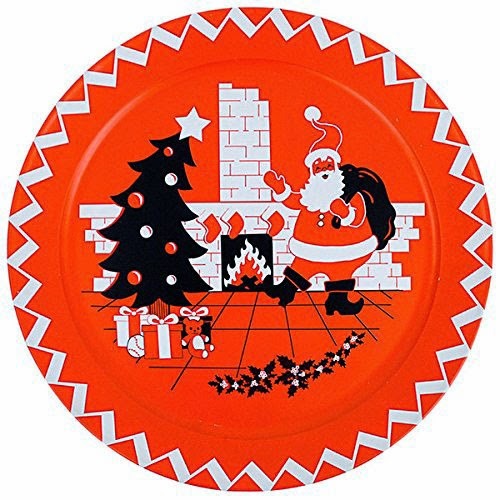 a holiday favorite returns; our classic retro santa serving plate is back for the holiday season! love retro christmas decorations from yesteryear? with our vintage-inspired santa plate fashioned from tin; we've got just what you need. based on an original mid-century modern find from denmark; we re-created this must-have christmas tray exactly like the original 1950s trays. unique and highly decorative; use tray for serving or use as the most perfect holiday wall decor accent piece. our customers give this classic santa tray high marks for form and function. decorated with a traditional christmas design; the trays are great for decorating and entertaining. a holiday classic and a heirloom-quality ornament to be used year after year!